Pour other types of Splattershots, allez voir Splattershot (disambiguation). Le Liquidateurest un Lanceur dans Splatoon et Splatoon 2. Il s'agit d'une arme emblématique, couramment vue dans le matériel promotionnel de Splatoon et dans le cadre des Inkling Girl et Boy amiibo. Le Liquidateur est une arme polyvalente en termes de puissance, de portée et de cadence de tir, ce qui le rend facile à utiliser pour les joueurs de tous niveaux d'expérience. Il a un look coloré simpliste, semblable aux pistolets à eux pour enfants dans la vie réelle. Lorsqu'il est utilisé, il pulvérise un éclaboussement régulier d'Encre jusqu'à ce que le Réservoir d'encre du lecteur soit vide. Il est offert avec un ensemble comportant les Bombes Ballons et le Bombardement. Ah, the classic Liquidateur. It's a modified version of a weapon that was used in the Great Turf War. When this weapon made a splash with the youth, it helped to popularize the Turf Wars we know today! The full-auto Splattershot, Burst Bombs and Bomb Rush make this an ideal set for learning the ropes! Of course, even pro battlers might want to go back to basics and use this classic set once in a while! Ah, the classic Liquidateur. It's a modified version of a weapon that was used in the Great Turf War of old. When this weapon made a splash with the fresh kids, it helped popularize the Turf Wars we know today! The full-auto Splattershot, Burst Bombs and Bomb Rush make it a great choice for any situation. Whether you're a newbie or a pro, learn to use this set effectively and you'll be a force to be reckoned with! Cet article (ou cette section) parle d'un contenu qui n'est pas encore disponible ! Les informations peuvent donc changer au fil du temps. Merci de relire notre règlement concernant les rumeurs et fuites avant d'ajouter des informations fuitées ! The weapon re-appears in Splatoon 2 and has a new design. It has a purple stripe design that wraps around the barrel, a dark blue/purple grip and a dark green muzzle. The barrel is now part of the gun body, instead of on top, and the muzzle now comes out of the barrel. There is a cap where the tube connecting the barrel to the gun used to be, reminiscent of the caps used to refill a water gun full of water in real life. It now comes with Tenta Missiles instead of the Bomb Rush. The Hero Shot, a modified version of the Splattershot, is the default weapon in Octo Valley and the Squid amiibo challenges, but it cannot be used anywhere else. The Bomb Range Up ability allows players to throw Splat Bombs, Burst Bombs, Suction Bombs, Point Sensors, and Disruptors up to 50% farther. This ability encourages frequent use of the Splattershot's sub weapon, the Burst Bomb, which can splat enemies in two hits when hitting directly. With Bomb Range Up, players using the Splattershot can take out opponents from a safe distance. No brand increases the chance of rolling this ability. The Damage Up ability increases the power of burst bombs. With just 3 Damage Up ability just one burst bomb and one shot kills a player with no Defence Up ability. Squidforce is 5x more likely to roll this ability. The Swim Speed Up ability allows players to swim faster, which makes harder target to kill and much more mobility when moving in squid form. Ink Recovery Up allows players to constantly throw Burst Bombs and have frequent presence on the map. The Jungle Hat(NA) (Safari Hat(EU/OC)) comes with Ink Saver (Main) as a main ability. Because it is produced by Firefin, it also has a 5x higher chance of rolling Ink Saver (Sub) as a secondary ability. These abilities allow Splattershot users to continuously spray ink and throw Burst Bombs without wasting as much time to wait for ink to refill. The Rockenberg Black comes with Damage Up as a main ability. Because it is produced by Rockenberg, it also has a 5x higher chance of rolling Run Speed Up as a secondary ability. 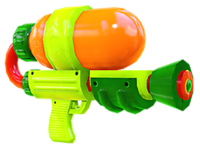 This combination allows players to take advantage of the Splattershot's unique capabilities such as being able to move around faster as well as giving more power to a Burst Bomb. The Layered Anchor LS comes with Run Speed Up as a main ability. Because it is produced by SquidForce, it also has a 5x higher chance of rolling Damage Up as a secondary ability. This is an alternative to the Rockenberg Black if you can not find it. The Shark Moccasins comes with Bomb Range Up as a main ability. Because it is produced by Splash Mob, it also has a 5x higher chance of rolling Ink Saver (Main) as a secondary ability. This combination allows players to take advantage of the Splattershot's unique capabilities and the Burst Bomb's power. The Splattershot was the first playable Main Weapon, available in the 2014 E3 Demo. At that time it was called the "Ink Shot." With five variants, the Splattershot has the most out of all weapons. An Inkling firing a Splattershot. Two Inklings posing with Splattershots. A team of Inklings firing Splattershots. Official art of an Inkling holding the Liquidateur. Art of a team of Inklings - the closest is holding a Liquidateur. Another team of Inklings - the closest also has a Liquidateur. Three male Inklings, with the center one holding a Liquidateur. Three female Inklings, with the center one again holding a Liquidateur. Another female Inkling brandishing a Liquidateur. Sunken Scroll 18, with the Liquidateur at the upper right. Concept art of Inkling fashion, with an early version of the Liquidateur. The Inkling Boy amiibo holds the Liquidateur. The Inkling Girl amiibo holds the Liquidateur. A rabbit holding the Liquidateur, from when the main characters of Splatoon were to be rabbits. The Liquidateur as it appears in Splatoon 2. Artwork of an Inkling girl holding a Liquidateur. The select screen from the Switch event demo selecting the Liquidateur. The info page on for the Liquidateur from the Switch event demo. Splattershot is a combination of Splatter (as well as Splat) and Shot. Its japanese name, スプラシューター supurashūtā, is a combination of either Splat or Splash, and Shooter. Supurashūtā Splashooter, portmanteau of "splash" and "shooter"
Cette page a été consultée 2 974 fois.